Permarachne novokshonovi, a Permian fossil that was similar in appearance to the Devonian Attercopus fimbriunguis. Figure from Selden et al. (2008). Selden, P. A., W. A. Shear & M. D. Sutton. 2008. Fossil evidence for the origin of spider spinnerets, and a proposed arachnid order. Proceedings of the National Academy of Sciences of the USA 105 (52): 20781-20785. A new paper published today presents us with a revised description of Attercopus fimbriunguis, the stem-spider (thanks to William Shear, one of the paper's authors, for sending it out). With this redescription, the position of Attercopus is secured as one of palaeontology's great "transitional fossils". Attercopus is a fossil arachnid from the Middle Devonian (bonus question: what is the connection between Attercopus and Barad-dur? 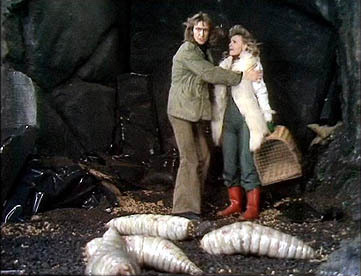 ), so dates back to when the terrestrial environment was first finding its feet (and in those invertebrate-dominated days, there were often a lot of them to find). Most modern terrestrial animals were yet to make an appearance - the vertebrates were still keeping to the water, the insects were there but not yet a significant part of the ecosystem. It was the age of the arachnids and myriapods. Even within the arachnids, most of the taxa then present would have been unfamiliar to modern humans, and the currently most familiar group of arachnids, the spiders, had not yet made an appearance. That is where Attercopus becomes so significant. Spiders are actually not typical arachnids at all. Like all other arthropods, the ancestral arachnid form has the body divided up into segments. These segments are externally visible as the cuticle is divided into plates, with separate dorsal (tergites) and ventral (sternites) plates. In most living arachnid orders (such as scorpions and harvestmen), these external plates are still present. In most spiders, the cuticular plates have become fused, and the segmentation is not externally visible. One small group of spiders that is today restricted to eastern Asia, the Mesothelae or liphistiomorphs, differ from all other living spiders (the Opisthothelae, to which they form the sister group) in retaining visible tergites on the opisthosoma (abdomen), though they do not have visible sternites. Mesothelae also differ from Opisthothelae in lacking poison glands in the fangs. As well as the concealed segmentation (independently acquired by acaromorphs such as mites), spiders are also distinct in their production of silk. Only one other group of arachnids, the pseudoscorpions (as well as numerous groups of insects), produces silk. In pseudoscorpions, the silk-producing glands are in the pedipalps. 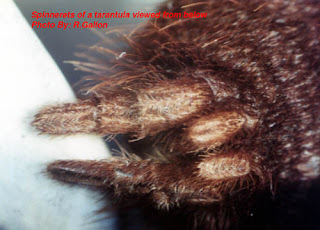 In spiders, they are at the back end of the underside of the opisthosoma, and open through appendages called spinnerets (photo below from here). The presence of silk-producing spigots in Attercopus was first established in 1991, when it was connected to an isolated Devonian 'spinneret' described two years previously (Selden et al., 1991). As redescribed by Selden et al. (2008), however, Attercopus shows a number of significant differences from modern spiders. It retains distinct external segmentation, both tergites and sternites. Also, rather than having the silk glands on spinnerets, the spigots are positioned directly on the underside of the opisthosoma (and their status as silk glands is confirmed in one specimen by the presence of a strand of silk preserved in the process of being exuded from one of the spigots!) The 'spinneret' previously described for Attercopus, as it turns out, was an artifact resulting from post mortem folding of the cuticle. Without the guiding control of spinnerets, Attercopus would not have produced silk in well-defined strands like a modern spider, but in more of a shapeless mat. This is not surprising - the distribution of silk use in modern spiders suggests that its use in reproductive functions (constructing egg cases, spermatophores, etc.) or in constructing burrows probably pre-dated its use in prey capture. Part of a fossilised Attercopus, showing silk preserved while being released from one of the spigots. Figure from Selden et al. (2008). Attercopus also appears to have lacked poison glands (again, their previously-suggested presence appears to have been an artifact), which tallies well with their absence in living Mesothelae. Perhaps most intriguing of all (at least to me) is that Attercopus possessed a segmented flagellum. The flagellum is a character of the Uropygi (whip scorpions) which, together with the Amblypygi, form the probable living sister group to spiders in the clade Tetrapulmonata (Shultz, 2007). At present, we cannot say whether the flagellum is an ancestral feature of Tetrapulmonata that was lost in spiders and amblypygids, or was independently derived in uropygids and Attercopus. Selden et al. (2008) also identify sternites and a flagellum in a Permian spider-like fossil, Permarachne novokshonovi, and establish a new order, Uraraneida, for the two fossils. This is not a major change in classification, as Uraraneida is still regarded as the stem group to modern spiders. Also, as the characters uniting Attercopus and Permarachne (free sternites and a flagellum) are both probably plesiomorphies, the Uraraneida is not necessarily monophyletic. With the definite exclusion of Attercopus from the crown group, the earliest known true spider is now Palaeothele montceauensis, a liphistiomorph from the late Carboniferous. 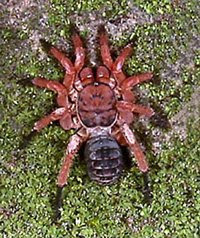 Liphistius owadai, a modern species of spider retaining free tergites. Photo from here. The big change between Attercopus and crown Araneae seems to have been the development of spinnerets instead of bare spigots. Developmental genetic studies show that the spinnerets are homologous to opisthosomal legs, which is remarkable because arachnids don't have legs on the opisthosoma. To find opisthosomal appendages on the arachnid lineage, one has to go to their living sister group, the horseshoe crabs. Because of the derived position of spiders within arachnids, and the fact that all other fossil arachnids lack opisthosomal appendages, it is unlikely that opisthosomal appendages in spiders represent a retained plesiomorphy that was lost in all other arachnids. Selden et al. (2008) suggest that this may represent reactivation of suppressed developmental genes, as supposedly seen in stick insects. But despite my wince at their ill-chosen supporting example, legs-to-spinnerets is perhaps a good candidate for such a process. While obvious opisthosomal appendages are not present in arachnids, developmental studies indicate that the covering plates of the arachnid book lungs are homologous to appendages, and it has been suggested for scorpions that the sternites themselves represent fused appendage remnants. The sad fact, I feel, is that our understanding of how developmental processes evolve is still all too rudimentary. 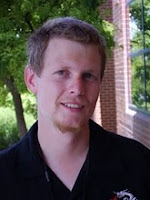 For all the vast amount of genetic studies that have been conducted in recent decades, most have been focused on a relatively small number of model species - Drosophila melanogaster, Danio rerio, Arabidopsis thaliana,... Consideration of a single species, or even a few closely-related species as has been done for Drosophila, becomes woefully inadequate when considering questions raised when debating the possibility of genetic recurrence. What happens to a developmental gene when it is inactivated for a certain function? Can it be readily reactivated, or does genetic drift seal its fate as a pseudogene? Is genetic reactivation even the only possible explanation - what about those genes that are still developmentally functional elsewhere in the body? Can they become activated elsewhere in the embryo to give rise to novel structures? Could the spinnerets of spiders be not recurrences of the lost opisthosomal appendages, but rather re-deployments of the appendages still present on the prosoma? Or could they somehow represent a combination of the two? Whatever the answers that are yet to be found, fossils such as Attercopus will always be critical in directing our searches for them. Selden, P. A., W. A. Shear & P. M. Bonamo. 1991. A spider and other arachnids from the Devonian of New York, and reinterpretations of Devonian Araneae. Palaeontology 34: 241–281. There may be more to the Barad-Dur connection than this, but ... as I recall, "Attercop" is one of the names Bilbo calls the giant Mirkwood spiders, and Barad-Dur is guarded by Shelob, an even larger spider. You're half right - Bilbo does indeed address the spiders in Mirkwood as "Attercop", an old English word for "spider" that is the source for the name Attercopus. That's not what I was thinking of for the second half, though. Is genetic reactivation even the only possible explanation - what about those genes that are still developmentally functional elsewhere in the body? Can they become activated elsewhere in the embryo to give rise to novel structures? Could the spinnerets of spiders be not recurrences of the lost opisthosomal appendages, but rather re-deployments of the appendages still present on the prosoma? Or could they somehow represent a combination of the two? Arthropod appendages being serially homologous, I'm not sure what the difference between the two is? The genes making opisthosomal legs were surely to a large extent the same as make prosomal ones. Wait! Yes I can! I thought it was a leg! Damen WGM, Saridaki T, Averof M, 2002. Looks more like "fringed claw" to me. "That's not what I was thinking of for the second half, though." My bad; Shelob guards Cirith Ungol, not Barad-dûr. Not sure what other connection there is. The genes making opisthosomal legs were surely to a large extent the same as make prosomal ones. Which is largely my question. Is it necessary to invoke reactivated genes, or can a mutation in the action of current genes mimic the action of a past gene? Mike: What I was thinking of is that during the timeframe of The Hobbit, Sauron is still in exile from Barad-dur, and currently holding residence in (drumroll) Mirkwood, with his presence a major factor in the presence of the giant spiders. Shoot, I'm actually a big enough nerd to know that (and that Sauron's alias during that period was "The Necromancer"), but I failed to make the connection.